I met Julie via Twitter. She runs a cool site called Free Birthday Treats. Make sure you check it out anytime there's a birthday in your family. After some get-to-know-you chitchat, Julie promptly arranged for a client company to send me a Card Cubby®. I've tried coupon organizers before, but I've never been disciplined enough to trim and sort routinely. Plus, I'm just not going to cram another thing into my purse and lug it around. But I obviously needed some help with the nest that had sprung up in my car. You can see why I was game for a new system. 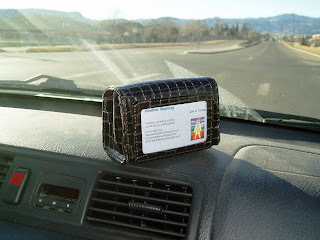 I got to choose from 7 colors , and my complimentary Card Cubby® arrived within just 2 or 3 days. 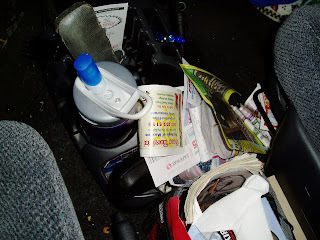 I dug out scraps from between said seats, from other nooks and crannies in my car, from "organizers" in my kitchen, parts of my wallet and purse, and a "dump box" I have in our family room. Pluses: The Card Cubby® is an attractive tool, better shaped for cards than other coupon wallets. It seems durable and I have hopes that it will be long-lasting. It has done well at pulling order out of chaos for me. And everyone I've shown my Card Cubby® to so far has wanted to buy one. Considerations: For me, the size is too big for a purse. 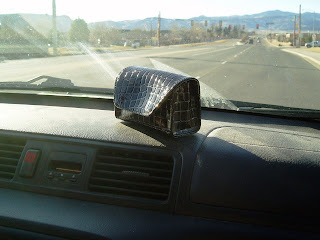 But it will work perfectly for the console of my car. The price is $20. I give the Card Cubby® a thumbs up. Head on over to select your favorite color. Thank you for a wonderful review of the Card Cubby Lori and for the plug to my Free Birthday Treats website. Thank you for reviewing the Card Cubby! very clever little contraption. though I bet T & R have more fun playing with the stuff between the seats? Just found this blog and read through a bunch of it! Great thorough reviews! I just got mine and I have to say it's very very cool - thanks Julie!